After a Senate decree in 123BC the state began providing the legions with their equipment. This, of course, included armor. As the years went by new styles of protection were developed and incorporated into the legions. It was not uncommon to have the men of a legion to wear a mix of different types of armor, some newly produced and some re-issued. There was quite a range of variety of style that could be found in each armor type. For instance, in a particular legion one soldier's mail armor may have had straight edges. His comrade may have been wearing mail edged with a zig-zag cut. Still another soldier might have extra flaps of mail on the shoulders. To make things simple, I have made only one illustration for each type of armor described here. In Rome’s very early history men wore fitted bronze plate armor in the Greek hoplite style. These were well decorated with animal, mythological and chest muscle designs. No Roman examples have been found in excavations, but sculpture shows them being used by officers and emperors well into the 1st century AD. The rectangular strips dangling at the sleeves and waist in this illustration are called pteruges. 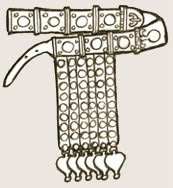 Made of layered linen (or perhaps leather), they added protection to the upper arms and thighs, while conserving metal. They were probably attached to a cloth arming doublet worn under the armor. See: J.L. Sebesta, L. Bonfante, "Costume as Geographic Indicator: Barbarians and Prisoners on Cuirassed Statue Breastplates" in The World of Roman Costume. Masidon WI. University of Wisconsin Press, 2001. (Loricae Hamatae plural form) translates as "hook armor," referring to the hook which fastened the shoulder straps. There is some dispute over the origins, but mail was probably first developed by the talented smiths of Gaul. Mail showed up in the Roman armies in the first half of the 2nd century BC. A typical mail coat might weigh 15 lbs. It provided excellent protection, along with great flexability. A belt was worn to bring some of this weight off the shoulders. A padded cloth garment would be worn underneathe called a subarmalis, "under-armor." Variations of this armor continued to be used well after the Roman Empire itself was gone. Lorica Plumata, "feather armor," was an expensive variant of scale armor. This consisted of a coat of ring mail on which small bronze scales were attached. These scales were only fastened at the top, which allowed them to rustle in the wind much like the feathers of a bird. 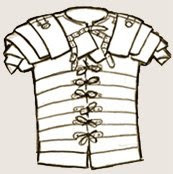 The Latin term, Lorica Segmentata, is used to describe the segmented armor. Yet, it is not known by what name the Romans themselves used. This armor appears to have been a purely Roman invention. It may have partially patterened after the armor of certain gladiators. This armor was made up of many pieces of laminated iron all bound together with leather sraps and metal hooks, forming a very flexible and strong protection. It began to be issued to the legions during the reign of Emperor Augustus. The earliest fragments of this armor have been found at Kalkriese, the presumed site of Varus 9 AD battle with the Germans in the Teutobergen Wald. By the resign of Tiberius this form of armor had gained widespread use. It appears to have fallen out of favor after the mid second century AD. 1. Bishop, M.C. Lorica Segmentata Volume I: A Handbook of Articulated Roman Plate Armour ,. Armatura Press, 2002. 2. Thomas, M.D. Lorica Segmentata 2 ,. Armatura Press, 2003. 3. Mike Thomas is working on Lorica Segmentata 3. 4. Photo of armor fittings from the lorica segmentata on the British Museum website. 5. Mike Bishop’s website discusses lorica segmentata. Called balteus early in the empire and then cingulum militare in later times. The mark of a soldier, belts were not meant for civilian use! When worn over chainmail, the belt helped to take some of the weight off the soldier's shoulders. In the first half of the 1st century AD it was common to wear two belts in the army: one to hold the sword and one to hold the dagger. Foot soldiers wore their sword on their right, officers on their left. In the Later Empire, this distinction fell away. The belts were rather narrow and were decorated with metal plates all the way around. The decoration of each bronze plate could be quite ornate. They featured embossed or engraved designs, sometimes plated with tin, and in rare cases coated with silver foil. The engraving sometimes had blue-black niello inlay. During the 1st and 2nd centuries AD the belt supported several vertical strips of metal-studded leather, forming a groin guard. However, judging by the meek protection offered a few dangling pieces of leather and the ornate decoration, it may be that this apron's more important purpose was to portray a man's social status as a soldier. 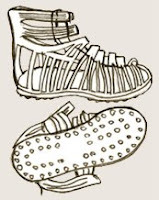 Roman military sandals used iron hob-nails as treads, rather like the cleats of a modern-day football player. These were used for the 1st and 2nd centuries AD. After that time boots became more popular. 2. Connolly, Peter. The Legionary. Oxford University Press, 1988. 3. Connolly, Peter. 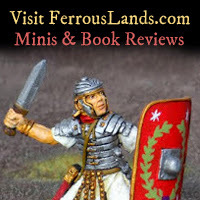 Greece and Rome at War,. Greenhill Books 2006. Actually the earliest date so for for lorica segmentata is 9BC, from Dangstetten, meaning that the Kalkriese type had been in use for at least eighteen years by the time of the Varus disaster. Evidence for Newstead armour starts turning up in Hadrianic period depostits and there are indications that it may have survived as late as the late third century (and possibly longer), although Bishop has proposed a further type with a scale shoulder section based on the Alba Iulia sculpture, which the third century evidence from Zugmantel may be connected with.